The wireless audio claims are a wee bit overblown, but that doesn't mean it's not a good value. Most people settle for a sound bar when they want something better than the pipsqueak sound their TV’s speakers put out. And since most sound bars have limited abilities when it comes to bass response, a big percentage of those folks buy one that’s pre-paired with a wireless subwoofer. But when it comes to delivering true surround sound, only the most-expensive sound bars can compete with a 5.1-channel speaker system driven by an A/V receiver. 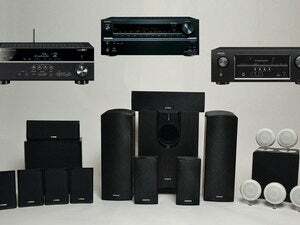 The CineHome HD is a true 5.1-channel audio system that keeps the wires to a minimum. But many people are allergic to all the boxes and wires that such systems entail, especially when you need to drag speaker cable from one end of the room to the other to connect the surround channels. 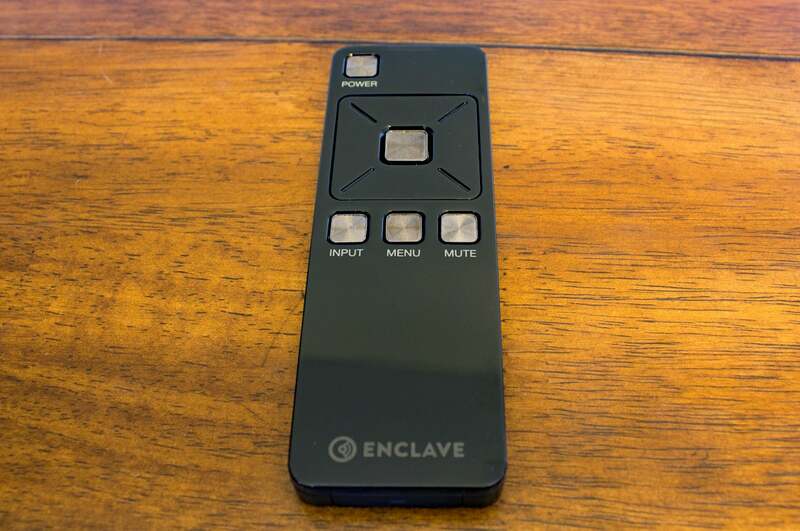 Enlave Audio’s CineHome HD simplifies things somewhat. I say somewhat because all six of its components are tethered to a power source (the sub uses an in-line brick and the other speakers rely on wall warts). Placing the sub should be fairly easy, since your ears won’t be able to pinpoint the origin of low-frequency effects, but if you don’t have outlets in the back of your room, you might need an extension cord and a power strip to plug the speakers into. The center channel can accomodate up to three HDMI inputs, a digital optical input, and a 3.5mm analog aux input. But there’s only one HDMI output. If your TV is in an entertainment center, you’ll need one that has space below the TV in which to stash the center channel, because the cabinet is about 5.5 inches high and will block the bottom of the TV screen (unless your TV has an extraordinarily tall stand, or you put it on a riser). If your TV is mounted to the wall, you’ll need a table below it. Alternatively, you could hang a shelf that’s at least eight inches deep to accommodate the cabinet and leave enough room for cable connections, but that wouldn’t look very pretty. I’ll start this part of the review with movies, but I’ll cover support for features such as Dolby Digital in the next section. Unlike any moderately priced sound bar I’ve heard, the CineHome HD can truly reproduce a movie soundtrack’s surround effects. With the exception of Yamaha’s high-end sound projectors, no front-of-the-room-only speaker system I’ve heard can do that without placing physical speakers in the back of your room. 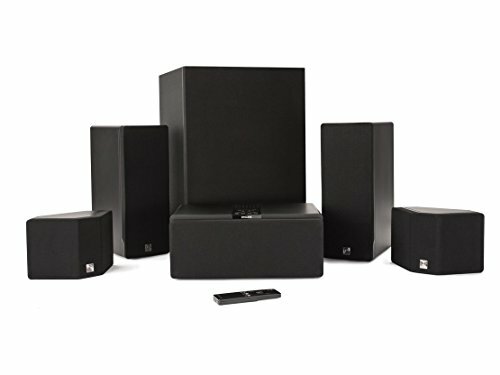 Having said that, I’ve heard plenty of wired home-theater speakers that do an even better job, but I’m presuming you’re reading this review because you want a 5.1-channel system and you absolutely don’t want to deal with wired speakers. The CineHome HD had no problem filling my 13x19-foot home theater with sound while playing the soundtrack for The Avengers: Age of Ultron. It was particularly strong rendering dialog through its center channel. Even the tender scene in which Bruce Banner (Mark Ruffalo) and Natasha Romanoff (Scarlett Johansson) whisper to each other came across bright and clear. During the epic battle sequences, however, I found myself craving just a little bit more boom. But I was able to cure that by turning the front-firing subwoofer to face a corner of the room, keeping it about four inches from the wall. I also found the volume from the surround channels to be a bit wanting, even with the balance setting between the front and rear channels set to maximum. The control panel on the center channel has the same buttons and controls as the IR remote. I found the system to be on the bright side when listening to music, too. Cara Dillon’s angelic vocals on her performance of “The Lass of Glenshee,” from her 2010 release Live at the Grand Opera House came across just this side of shrill if I cranked the volume too high. The system sounded more balanced with some other tracks, including the Crusaders’ cover of “Mercy, Mercy, Mercy,” from their album Healing the Wounds and the Carolina Chocolate Drops performance of “Country Girl,” from Leaving Eden. 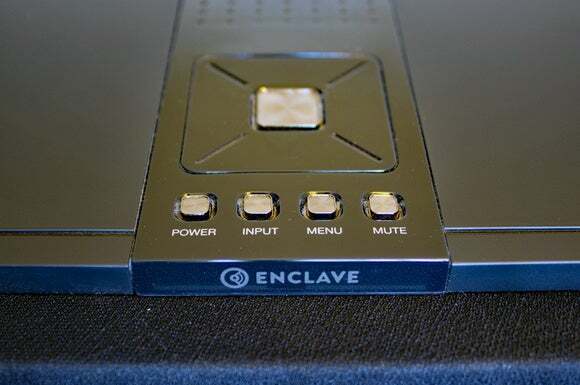 Enclave’s system has six independent Class D amplifiers, one for each channel (front left and right, surround left and right, the center channel, and the subwoofer). An onboard processor decodes Dolby Digital and DTS surround-sound movie soundtracks on DVDs. It also supports Dolby Digital Plus for web streaming services, and it can transform the audio from stereo sources into pseudo surround sound using Dolby Pro Logic II. For the latter, you’ll find settings for music, movies, and “auto,” which is supposed to pick the most appropriate encoding for you, but I preferred to just turn that processing off while I listened to music. In off mode it uses just the left and right channels plus the sub. An onboard noise generator helps you verify that each speaker is working, but there’s no room-optimization software that can compensate for your space’s sonic shortcomings. 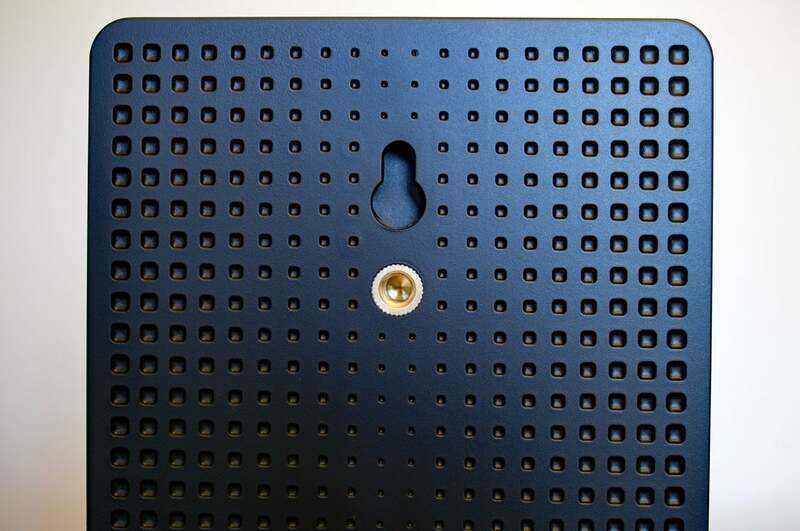 If you’d like to hang the front left/right speakers, you can use either the keyhole (for the wall) or the standard threaded mount (for stands). The left/right surrounds have the same options. One thing that’s missing—significantly so, in my book—is a decoder for the high-resolution soundtracks on Blu-ray discs (Dolby TrueHD and DTS HD Master Audio). Needless to say, the system also does not support the newish 3D audio formats, Dolby Atmos or DTS:X. If that’s something you’re interested in, I strongly recommend you check out Onkyo’s HT-S7700 Home Theater in a Box. There are a lot more wires, but a lot more features—and it’s cheaper to boot. But I digress. The CineHome HD has three HDMI inputs, so it can support a Blu-ray player, a set-top box, and a video streamer or any other combination of sources. But it’s limited to HDMI 1.4b and HDCP 1.4. 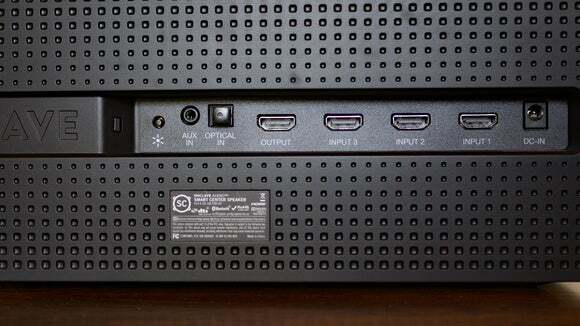 That means it can handle 4K resolution, but you’ll need a converter box if you connect it to a source streaming content protected by HDCP 2.2 (an UltraHD Blu-ray player, for instance). There’s also only one HDMI output. The CineHome HD supports ARC (audio return channel), but you’ll need an HDMI matrix switch if you use a TV and a video projector. The system’s remaining inputs are a Toslink optical digital and a 3.5mm analog. You’ll also find a switch in the back that turns on a small LED that’s supposed to illuminate its rear I/O panel. It’s a brilliant idea poorly executed: The LED is angled so that it shines directly in your eyes when you’re peering over the top of the cabinet, making the ports harder to see instead of easier. 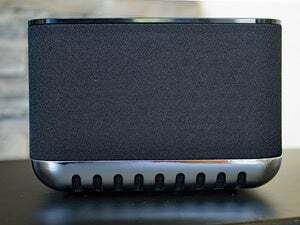 In addition to its wired I/O, the CineHome HD has a Bluetooth radio (though it doesn’t support the aptX codec); and if you run Enclave’s app on your Android or iOS device, you can stream music from libraries stored on your device; on your home network; or from Spotify, Tidal, TuneIn, or SoundCloud. But all of those sources rely on your mobile device being in somewhat close proximity to the system since it’s the conduit between the speakers and your music. Here’s a better idea for anyone who buys one of these systems: Consider using something in your entertainment system that can connect to your network and that has an HDMI output—be it a smart TV or one of the better Blu-ray players. Stream your music through that conduit, instead. I found the infrared remote to be a little frustrating to use. Button presses didn’t always register, and the remote must be pointed precisely at the cabinet to be at all effective. Controls on the top of the center channel are duplicated on a small remote control that’s bound to get lost in your couch cushions. Both controls work in concert with a menu that’s displayed in the upper-left corner of your TV. The onscreen display also pops up when you adjust or mute the volume. The infrared remote has a very narrow beam, and the system won’t respond unless the remote is pointed right at it. I found that frustrating, but I’ve become spoiled by an IR repeater that I installed in my home theater years ago, and by the RF remotes that came with my Roku 3 box and my DirecTV satellite-TV system. 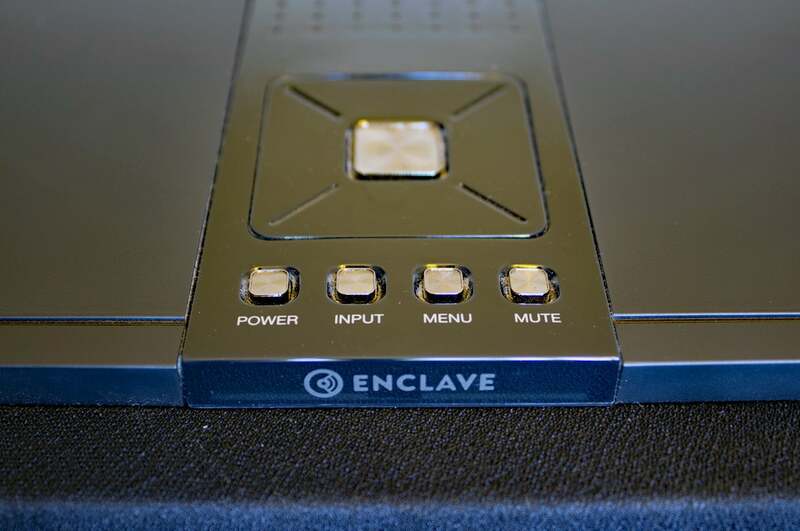 If you’re a home-theater-audio purist who can’t abide wires, and sound bars have left you wanting more, Enclave Audio’s CineHome HD is worthy of consideration. It’s not perfect, but it delivers plenty of bang for the buck and it eliminates at least some of the wiring that can make a traditional 5.1-channel system problematic to set up. It’s better than most of the sound bars in its price range, but it’s wireless technology isn’t free. 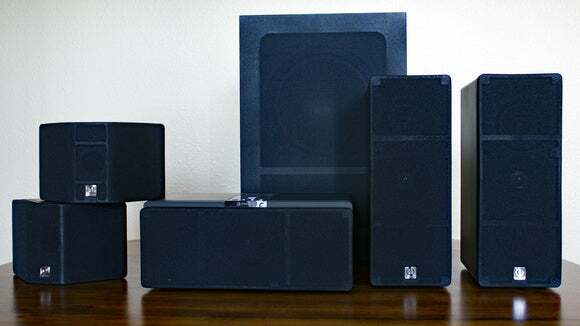 You could buy a wired system for less and you might get even more features—such as support for Dolby Atmos, or a Spotify connection that doesn’t tie up your smartphone.